From the earliest nomads to today’s globe-trotting adventurists, human beings have travel built into their psyche. And we’re not the only ones. From the smallest monarch butterfly to the ocean’s largest whale, so many species in the animal kingdom migrate as well. But unlike our animal brethren, there is a conundrum we face: traveling contributes negatively to the global changes WWF works to combat daily. How does the environmentally responsible, modern-day nomad reconcile this? As with all aspects of conservation, you have choices. You can choose a tour company that makes wise decisions about its impact on the places you visit. A company that embeds your travel experiences with education and fosters awareness of conservation issues. One that does its part to offset carbon emissions and runs its operations in environmentally sound ways. 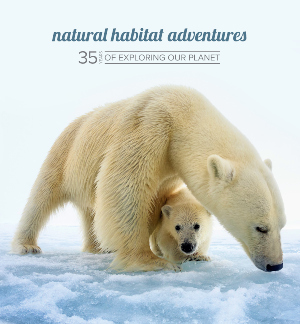 WWF partners with Natural Habitat Adventures because NHA firmly believes in these ecologically sensitive practices. And travel is also an extraordinary tool for you to experience the wonders of our planet and to inspire you to support conservation. We are proud to continue our decade-long partnership with NHA, and wish you safe travels as you migrate across this magnificent planet of ours.